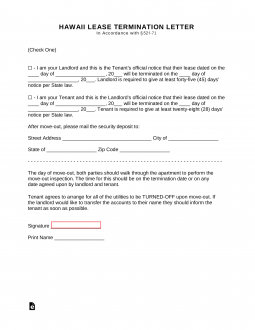 The Hawaii Lease Termination Letter Form is a required document when either a landlord or tenant wishes to terminate a month-to-month agreement. The State of Hawaii’s Statute § 521-71 requires that a landlord wishing to terminate a month-to-month contract must give their tenant at least forty-five (45) days’ notice their agreement shall terminate. Similarly, a tenant wishing to terminate such a rental agreement with a landlord must give twenty-eight (28) days’ notice of this intent. For this letter to be effective and to fully be in compliance with Hawaii state laws, the receipt of this letter by the party it is addressed must be at least the appropriate notice period. That is, state law will require a tenant receive this document at least forty-five days before the termination while the landlord must receive this document at least twenty-eight days before the termination date. This policy is enacted to protect the interests of each respective party. Generally, it is possible for a tenant to find a new residence within a forty-five day time period and a landlord should be able to find a new tenant within twenty-eight days. Obviously, if one party can give more notice it is recommended to do so as this will show a certain consideration to the other party. Minimum Termination Period – 45 days’ notice for a landlord that decides to cancel and 28 days’ notice for tenants that terminate their lease. Step 1 – Check the first box then enter the date of the lease. The lease date will act as a reference to the lease arrangement. Then enter the day, month, and year of the termination date. Do not check the second box or address the second paragraph in any way. Step 2 – Sign and print your name at the bottom. Step 1 – Check the second box (ignore the first one), then enter the date of the lease arrangement. Next enter the termination of the lease in the appropriate spaces. Step 2 – Odds are the landlord will be holding a security deposit. If this is the case, locate the third paragraph then enter the street address, city, state, and zip code where the landlord may send the security deposit.